How do I setup Payment processing in Unify Desktop? The process of making an offline payment allows Unify Desktop to capture payment details from the online order. Use the Payment screen if you want to use Unify Desktop to process offline payments or capture a previously authorized transaction. Unify Desktop currently supports Authorize.net, PayPal, and QuickBooks Merchant Service as payment processors. 1) Use Unify Desktop to process offline payments? • Select 'No, my online store processes payments' if payment processing is done at your Online store. In this case, all your orders will be received in Paid status and Unify Desktop will download the transaction ID from your store (if available). • Select 'Yes, use Unify Desktop to process payments', if you'd like Unify Desktop to handle the payment processing. Unify Desktop currently supports Authorize.net, PayPal, and QuickBooks Merchant Service as payment processors. • Select 'Yes, use Unify Desktop to CAPTURE payments that are AUTH-ONLY in my online store', if your online store has authorized the transactions but they are yet to be captured. (Only supported with Authorize.net and PayPal). Unify Desktop must be able to download the transaction ID of the authorization from your online store in order to capture the payment. • Authorize.Net: Use this option to configure Authorize.net to process payments for your online orders. Enter the Merchant Login and Transaction key provided by Authorize.net. Click on Test Connection to Authorize.net to verify your settings. • PayPal: Use this option to configure PayPal to process payments for your online orders. Enter the Username, Password and Signature provided by PayPal. Click on Test Connection to PayPal to verify your settings. 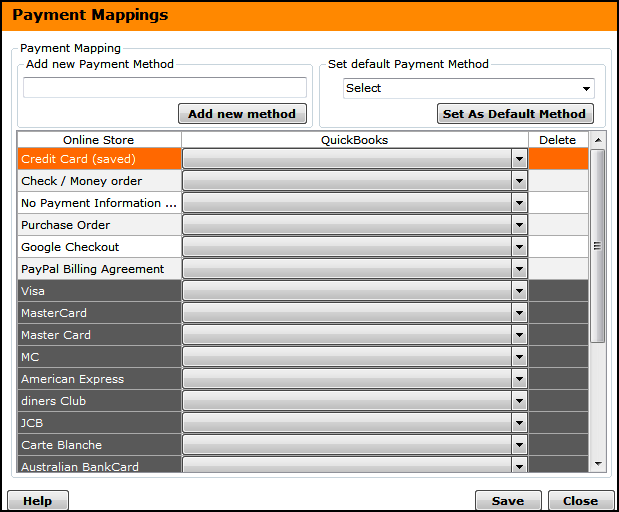 Use this screen to map your online store payment methods with methods you have setup in QuickBooks. Unify Desktop will display a list of Card Types and Payment Methods that are enabled in your online store on the left side. On the right side you'll see a drop down with list of payment methods setup in QuickBooks. Select the values and click the SAVE button. Unify Desktop also provides an option to enter text corresponding to your online store payment method and the ability to setup a default Payment method.